This is a sprawling account of America's first transcontinental serial killer,Slipton Fell. Raised by parents engaged in the Funeral business he learns to do autopsies and has an obsession with death. A huge man with large hands he is quickly dubbed "The Laughing Gorilla" due to the insane laugh he emits as he leaves his crime scenes. 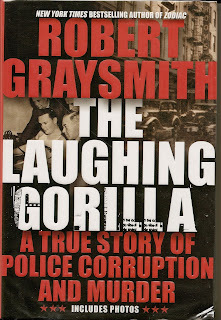 This book is also the story of the Police Detective in San Francisco, Captain Charles Dullea, who pursues the Gorilla Man for almost a decade. While trying to solve the case he is also faced with cleaning up a very corrupt Police Department. To complicate matters the Public Defenders Office has become a clearing house for criminals and crime. A string of safecracking heists is finally solved only to discover that the ring is lead by a Policeman. He gets his cohorts from the Public Defenders office! When I refer to the book as sprawling I mean that the author takes you from the initial crimes in San Francisco in 1926, to the wilderness of Canada and the interior of the United States as we follow the trail of the killer. Which murders are the work of the Gorilla Man and which are copy cat killings? In the days before forensic science had reached it's current state, this was no easy question. The book is loaded with characters, some who rival even the most imaginative creations of fiction. There is Police Chief Quinn with his armored automobile complete with a machine gun mount; there is the "Flying Squad", an elite motorcycle unit used to battle the criminal gangs along the waterfront; there are Madams and Longshoreman. They are all locked in a struggle to survive the daily life along the San Francisco waterfront of the 1920's through 30's. While Captain Dullea battles his own demons within the Department he never loses sight of the Gorilla Man. He let him slip away once and has never forgotten it. When the Gorilla Man returns to San Francisco after an absence of almost 10 years, Dullea is determined to bring this monster to justice. A must read for lovers of San Francisco and its' colorful history. The authors descriptions of the wharves and the Embarcadero,the Clock Tower and the daily grind of San Francisco all ring true. Set against the backdrop of the Golden Gate Bridge being built, you get a sense of a city emerging from it's past and building to a future. Written by Robert Graysmith, the man who idenitified the infamous "Zodiac Killer",this book is a product of the same painstaking research skills which aided in cracking that case.